The number of men volunteering for active service at the outbreak of the First World War was so high that recruitment officers were turning people away. However, by late 1915, as casualties rose and the true horrors of war became apparent, the Australian Imperial Force faced a shortage of men. In November 1915, Labor Prime Minister Billy Hughes toured Great Britain to promote Australia's war effort and promised the British Government that Australia would provide approximately 7000 new recruits per month. Upon returning to Australia, he realised compulsory military service would be essential to maintain Australia's numbers on the front line. The Prime Minister asked the government to change the laws to enact conscription and when this was refused, he decided to put it to the Australian people in a referendum to be held on 28 October 1916. The debate surrounding conscription divided the nation, especially in Queensland where the Labor Government of T J Ryan stood alone in opposing it. Campaigns leading up to the conscription referendum divided the community, as opposing groups presented their views in public meetings, marches and the press. Despite the efforts of police to avoid clashes between opponents, conscription 'disturbances' were reported across the state—in one case resulting in a man's death in Kingaroy. The worst clashes occurred at Rockhampton and Bundaberg where angry crowds threatened speakers and interjectors. The proposal for conscription was narrowly defeated with a margin of 49% for and 51% against. 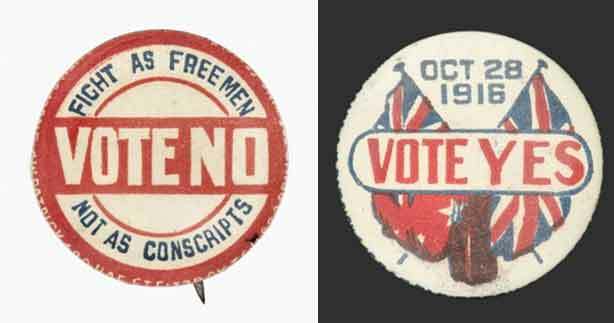 Conscription badges, Australian War Memorial. The outcome of the referendum did nothing to resolve the recruitment issues facing the Australian Imperial Force. With continued pressure from the British Government, Prime Minister Hughes would put the question of conscription to the Australian public again in 1917. Learn more about this second conscription referendum and the divisive debate that surrounded it. At the beginning of the First World War, Australian law required all young Australian men to participate in national service within Australia only if Australia came under direct attack. The 1916 referendum was the first of two during the First World War and one of many conscription debates throughout Australian military history. By 1916 both New Zealand and Great Britain had introduced compulsory military service. The referendum was lost in three states, including by a majority of 13,851 votes in Queensland. Local communities were awash with rumour and suspicion as the teachers at Richmond Hill, Charters Towers found in October 1916. They held a mock referendum among their pupils to demonstrate the referendum process and were accused of being partisan even though the conscription issue was not mentioned. Australia and South Africa remained the only participating countries during the First World War not to introduce conscription.